The writing was on the wall for the Los Angeles Lakers and Julius Randle at the start of last season — but they were unable to do anything about it. ESPN.com's Baxter Holmes reports that prior to the start of the season, Randle had developed "a small bump" on his right leg that would cause the big man sharp pain. At the time, the Lakers' then-rookie feared that he was going to break his leg. Unfortunately, he ended up being correct. "Though it's hard to say exactly why Randle broke his leg", Holmes writes, "a Lakers spokesman said it was thought that the stress reaction is 'likely what contributed to the break.'" Randle told Holmes that he didn't receive much treatment for the bump before the season, and that Lakers doctors told him that they would keep an eye on it. "And then when I broke it, I was like, dang, I wonder what happened — maybe that played a role?" Holmes quotes Randle. But he's ready to put the injury behind him and focus on basketball. "The first time I got on the court, I was like, 'Man, it's weird,'" he said. "But after that, honestly and truly, I had my head down and just played. I haven't thought about it at all." 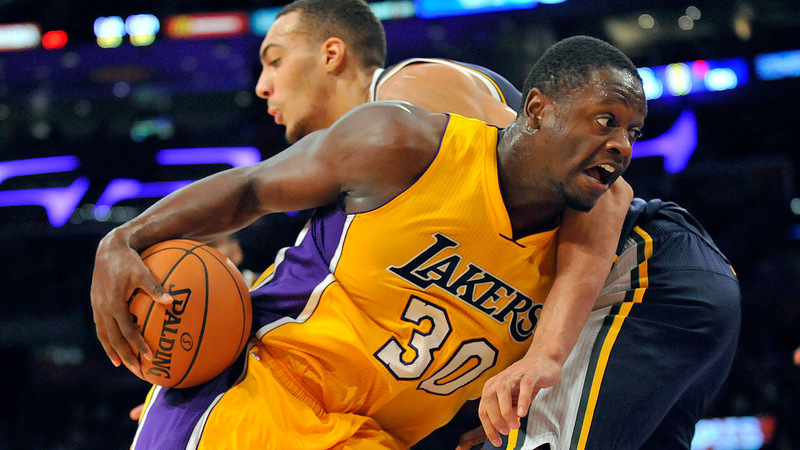 Randle participated in practices with the Lakers this week ahead of the team's jaunt to Las Vegas for summer league, where he flashed signs of dominance last year. Alongside D'Angelo Russell and the rest of Los Angeles' young prospects, Randle & Co. should put on one heck of an entertaining show for Lakers fans.